Join Disney's own "Sofia the first" princess in an adventure! 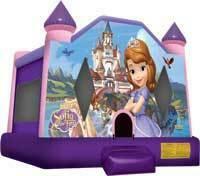 Our brand new moonbounce is perfect for your Sofia the First theme party or to add that final touch to your party. Little girls (and not so little) will love this bright pink and purple color moon bounce and wait until they see a picture of their favorite character, Sofia, at the entrance. Our jumpers have 360-degree mesh windows, so parents and spectators can have a clear view of all the fun children will have jumping in a large 15x15 ft square area. Dont' wait, book early knowing that your kids will absolutely love this moonbounce.